Clark School alumni Rajan (Raj) and Sandhya (Sandy) Mittu exemplify what it means to be lifelong Terps. And, their recent gift to support the A. James Clark Hall Fund will help ensure that generations of Terps will follow in their footsteps. An alumnus of the Department of Electrical and Computer Engineering and the Institute for Systems Research and a , Raj Mittu (B.S. ’90, M.S. ’95) was born and raised in Maryland and quickly became an avid Terps fan during his undergraduate years. When he wasn’t on the field himself playing intramural sports, it was a safe bet that Raj could be found cheering on University of Maryland athletics from the stands. But, as luck would have it, he first met his now-wife, Sandy, on the second floor of Glenn L. Martin Hall, of all places. Sandy, a mechanical engineering alumna (B.S. ’92, M.S. ’96), enrolled at the University of Maryland a year after Raj, but the two took a class together thanks in part to Raj’s participation in the Clark School co-op program. 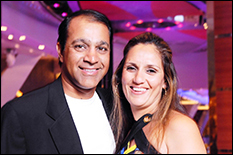 During Raj’s senior year, the two went on their first date and, after graduating, the couple stayed in Maryland to pursue career paths in engineering before getting married in 1993. As such, Raj and Sandy’s ties to the University of Maryland run much deeper than their Maryland residency. As the parents of two high schoolers, the couple now sees the university through the eyes of their children. Both Raj and Sandy have carried that realization with them ever since. As the CEO and co-founder of ESCgov, Inc., a government services contracting company, Raj strives to keep alive a spirit of entrepreneurship and creativity in the workplace. Sandy did the same as an engineer before making the switch to information technology, through which she developed expertise in data mining and data analytics. Today, Sandy proudly serves as a stay-at-home mom, devoting much of her time to volunteering support for their children’s school and extracurricular activities, and participating in community outreach programs to help those in need. This emphasis on family life is something that both Raj and Sandy have worked hard to carry with them through all their endeavors. When asked to describe his favorite things about leading ESCgov, for example, Raj first mentions the company’s work environment and culture of “putting family first.” ESCgov’s tremendous success – including its average $120 million in annual revenue – comes second. Even more, Raj and Sandy’s giving spirit extends beyond their donation of resources to the University of Maryland. In addition to supporting their children’s activities, the couple stresses the importance of helping others, including those who wish to pursue careers in the STEM fields. Their recent contribution of $100,000 to support the A. James Clark Hall Fund will benefit generations of University of Maryland students as they work to create innovations that will impact everyday life in areas ranging from human health and robotics, to energy and sustainability and cybersecurity. Through their gift, Raj and Sandy will establish Clark Hall’s Rajan and Sandhya Mittu InTerp Suite, a second-floor meeting and co-working space for student, faculty, and industry innovators. 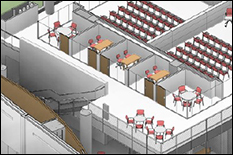 The space will consist of five meeting rooms designed to nurture the entrepreneurial spirit of Clark School students. Learn more about A. James Clark Hall online and find out how you can support the A. James Clark Hall Fund today. Clark Hall renderings provided by Ballinger.